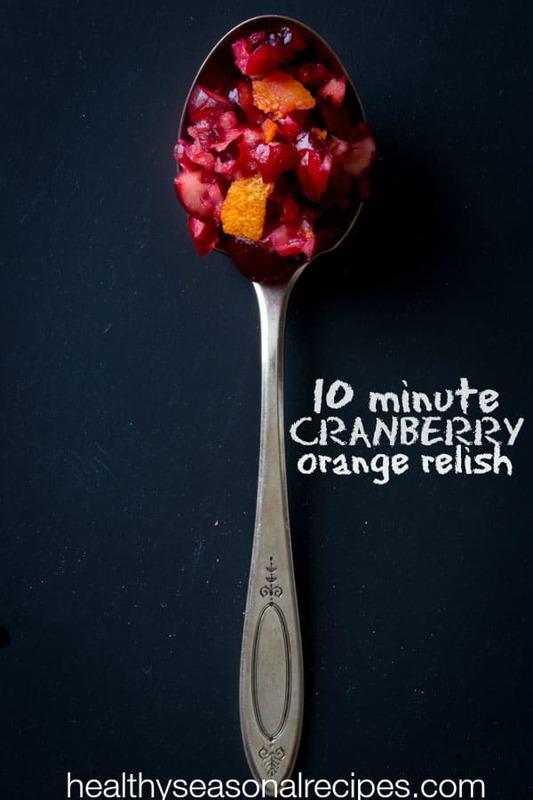 My mom’s 10 minute recipe for fresh raw cranberry sauce with orange for Thanksgiving. Thanksgiving dinner for my family was always about spending time with friends. Since my mom’s side of the family was in Texas, and my Dad’s was in Vermont, both too far away to travel to, we stayed home in Bucks County, and got together with some other families in the neighborhood. The Prices, the Guerreros, the Dunlaps and the Gordons. It was a huge group. My sister Jessie and I folded right into the big posse of kids, 10 of us all together. I was one of the youngest three, and spent a lot of time observing the misbehavior of the older teenage boys in the group. One year, I remember watching one of the older Guerrero boys holding a two liter of orange soda up to his eyeball and tipping the whole thing back with his eye open. This was of course on a dare but what was he thinking? Or there was the time when all the kids left the table and put on dress-ups and then went thanksgiving “trick or treating” to really confuse the neighbors. The parents, for their part had their own share of shenanigans. There was the time when one of the other moms brought a bottle of champagne over early in the day. While they were all supposed to be cooking the moms got too tipsy for their own good. Or there was the time when my dad decided it would be a good idea to set up a tape recorder on top of the Guerrero’s fridge to record the whole crazy evening. I’d love to get my hands on that today! I remember the people and the fun. And the laughter, and the f-bombs dropped by my dad. There were traditions that we had every year too. Without fail big Dirk, would always start the meal with a Quakerly moment of silence, everyone solemnly holding hands. And then we’d all start to pass the food around the table with mass confusion ensuing. After a moment, and a chance to try some of the meal, my Dad would stop everyone, and we’d all have to go around the table to say what we had for our first bite. I love that tradition and still insist on it to this day! And of course there was the food. My mom’s cranberry relish was one of the traditions that we could always look forward to. There were usually a few different cranberry sauces on the table, but this one was always my favorite. 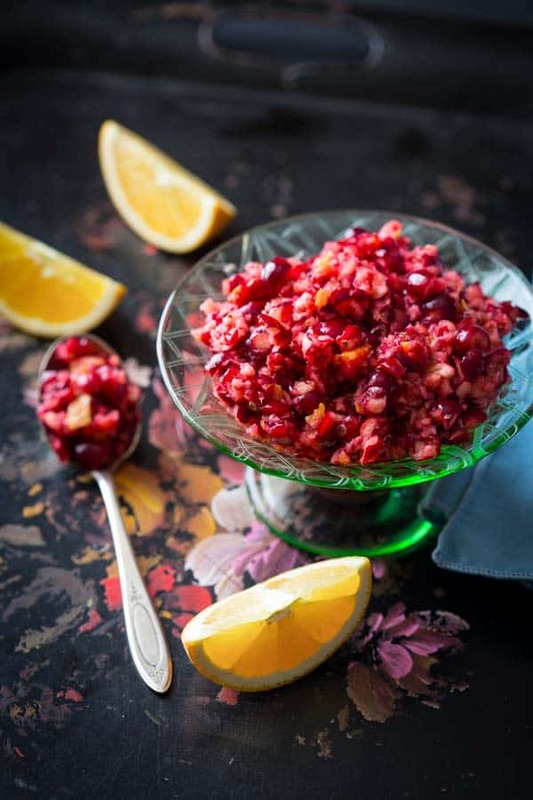 This month’s Recipe Redux is all about food memories, so I asked my mom this morning to share the recipe for her raw cranberry relish with orange with me. Making it today brought all of these memories flooding back and I couldn’t help but smile about them. She told me there wasn’t really a recipe, other than it is one pound of cranberries to one orange. Then she adds sugar and raspberry jam to taste. I made a half batch since it is only eight of us this year, and I want to serve more than one cranberry sauce. As I made it, I was surprised by how easy it was. It only took 10 minutes, maybe even a little less. I love how it is so fresh and bright. When you make it, feel free to doctor it up with as much sugar as you like. I stopped at three tablespoons, but you may like a touch more. Was Thanksgiving a meal with family or friends for you growing up? How many kinds of cranberry sauce will you be making this year? What Thanksgiving tradition or recipe brings back all those memories for you? Remove any seeds from orange (if there are any) and place in food processor fitted with steel blade attachment. Process until chopped into pieces no larger than a pea. Add cranberries and pulse until the cranberries are finely chopped. Whisk raspberry jam in a medium bowl to loosen. Add cranberry mixture and sugar and stir thoroughly until the jam is incorporated and the sugar is dissolved. Refrigerate up to one week. This looks fantastic! I love that your mom includes the orange skin. I bet that gives it a great flavor. Yes, I love that part of it too, the little bit of bitterness adds a great balance. It is so fresh! So colorful and fast! Yum, Katie! Hi Cindy. Fast is always good around here. Thank you so much for visiting today. Your Thanksgiving stories were so fun to read! This cranberry relish sounds wonderful. I love how vibrant it is! I have to say it was fun to write them too Genevieve. Thank you for your comment. I will make this and think of you all in Wycombe with find, warm memories of your Mom, always cooking and gardening! Thanks for sharing Katie!!! That makes me so happy to know Danielle. Have a great holiday. things i love: 1. that we both did a cranberry relish. 2. the lovely colors in your relish. 3. the awesome black painted surface. 4. that spoonful! 5. your fun reminiscing thanksgiving hijinks. I love that you love those things. Esp the fact that you love the black painted surface. I took that out and put the spoon on it on a whim, and it totally worked for me. I was like aha! I took 80+ shots of this cranberry sauce. That tray brought it together for me. Love this relish, also a favorite of mine. My mom used to invite the neighbors and singles to our house for Thanksgiving and it was always…interesting! Must be nice to have those memories! Hi Danielle. I have been getting so many responses that this is similar to their mom’s recipe too. I love that! Yes “interesting” indeed. One of the comments from someone who was there all those years read this and told me he thought it was remarkably PG. Ha ha. This relish is just so perfect for me to make for this upcoming Christmas. 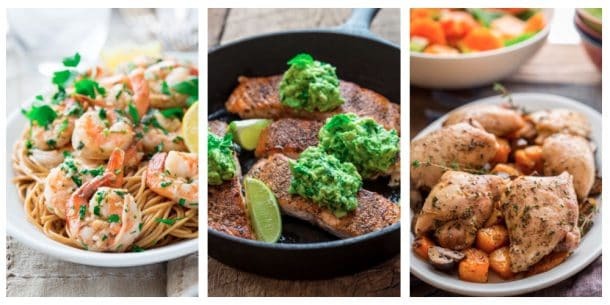 Love how quick, simple and delicious the recipe is! It is so easy. I can’t believe this is the first time I have made it. 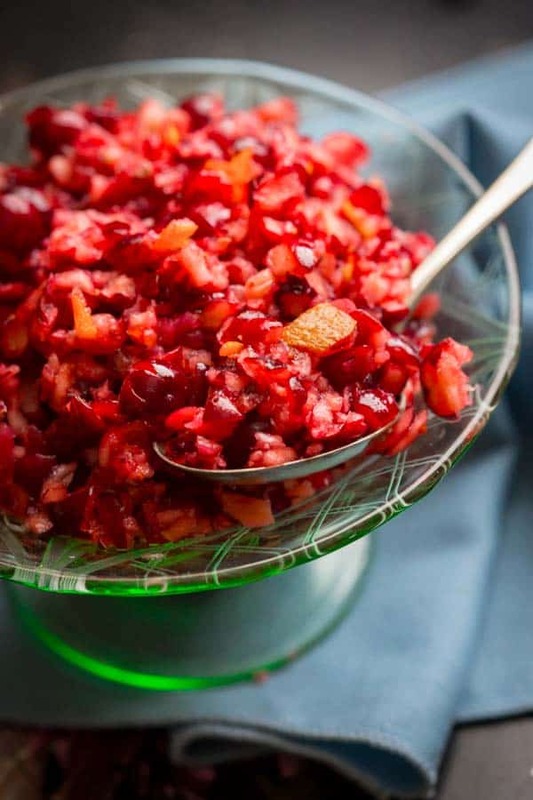 Your cranberry relish sounds and looks wonderful.Love its festive colour. Thanks so much Angie. Have a great week. Too beautiful — mom’s always know best! It is a good one. Thanks for stopping by Sarah. Oh you’re in for a treat Emily! Ouch – that orange soda to the eye sounds so painful!!! 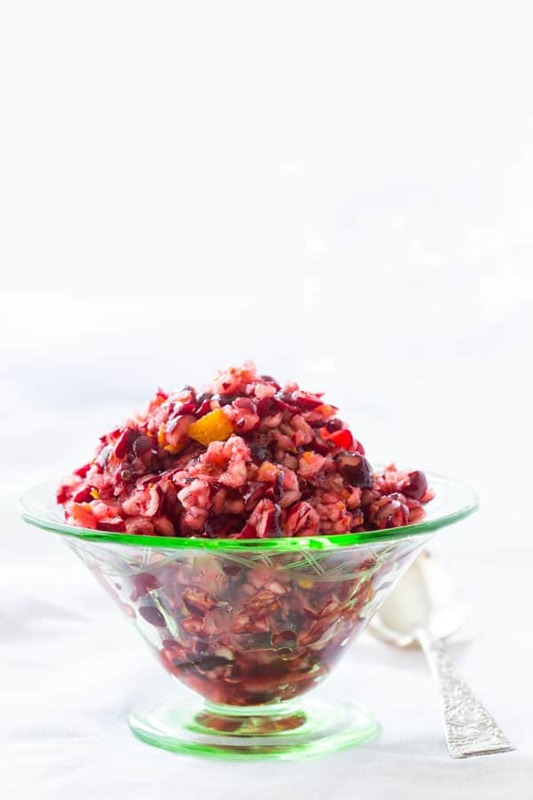 However – I bet this orange cranberry relish could help distract from the pain! It sounds wonderful! Ha ha. I know, it makes me smile thinking of all of those times. That recording would be so funny! 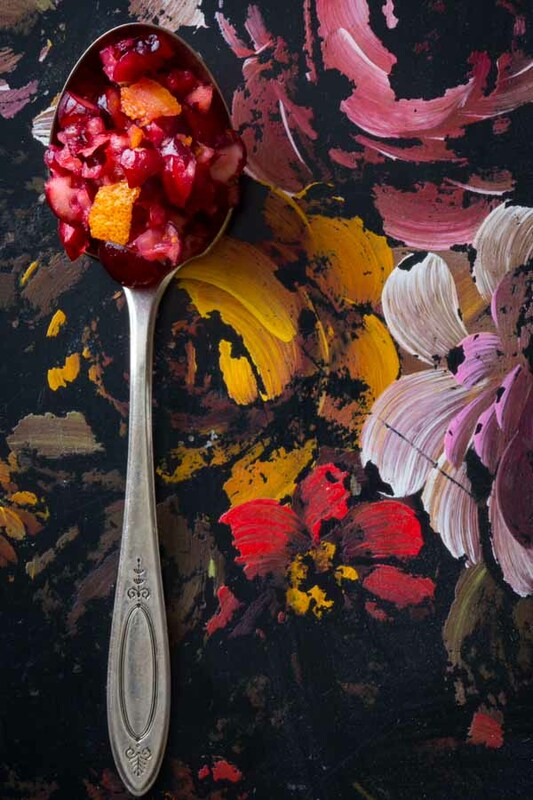 Okay— so I’m obsessed with how you’ve styled that relish on the spoon!!! I’ve been commenting to myself how I dislike how most people style cranberry sauce. I mean, I don’t think I could do it better, but YOU JUST NAILED IT! Aww thank you Kristina. I took 86 photos of this dang stuff. I couldn’t quite get it. Once I thought of the spoon idea, it started to come together for me. Thanks so much my dear. I love the little bit of raspberry jam you threw in there! Totally Rebecca. I had doubts that it would make a difference, but I love the flavor it adds. Great photos! 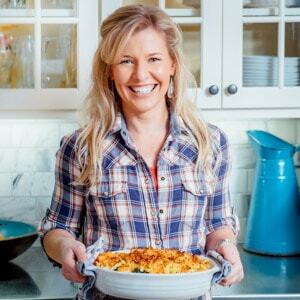 Great recipe, love that it is quick and easy to pull together. Hope you have a great Thanksgiving! At this point, 10 minute recipes are all I can handle adding to my list of things to do. Can’t wait to get the apron on, and start cooking. We make this too!! This is my husband’s absolute favorite. I sometimes use leftovers in pancakes. Just drop a few teaspoons on top of the pancake before flipping it. Happy Thanksgiving Katie! What a great idea Sally! I love the idea of this in pancakes. Maybe we’ll have that on Friday or Saturday while we have a full house. My mom said she also uses it in my Grandmother’s jello mold recipe with sour cream and pecans. I told her that sounds really retro and totally delicious to me. I’m impressed there were multiple cranberry sauces available haha- this looks delicious and I reckon would go so well in a sandwich- turkey too! When we were kids I know for a fact we always had the canned variety too for sure. And heck yes on a sandwich, this is gold. 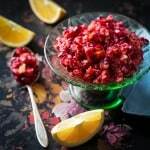 This cranberry relish looks incredible! Great for the Holidays! Beautiful pictures! So glad you like it Mira, and I am glad you stopped by. Hey lady! I missed this comment coming in last week. How did it go? Glad you tried this one. I made this one and the one from last year. Both were a hit. I am so honored that you did this. And 2 cups… that’s a lot! Hope all is well with you and the book project. I think it will work okay, but I haven’t tested it that way. It may be a little more juicy (and be darker red) than normal is my only thought. Let me know how it goes! Just wanted to say, my mom had the same set of silverware…what memories. I am a huge spoon collector. I love the detail on the handles. What a lovely classic set to remember from your childhood. When my husband and I were first married, I found recipes for cranberry orange relish, cranberry apple relish and I think there were a few more. It seems that they were written on the Ocean Spray cranberry bag. I made them all and they were wonderful. I might add that I’m practically a vegetarian and don’t eat meat gravy. I absolutely love putting cranberry sauce on my mashed potatoes. It’s both beautiful and delicious. The idea of putting the leftover relish on pancakes that you are making sounds intriguing. I love all the memories you included. In our local extended family, there were fifteen members and we had fantastic potluck feasts for every conceivable holiday. How I miss those great times! Many of the people are now dead. I live far away and haven’t had a feast with the extended family in over forty years. My mother used to make this, and I’ve continued. We add chopped walnuts to it, for some crunch. I’ve also started freezing small containers of it before fresh cranberries disappear from the markets; it freezes beautifully and is so refreshing with poultry or pork on a hot summer day! I love the idea of adding walnuts to this recipe. Thanks for the tip about freezing it! What a great idea. I’ll have to make another batch just for that purpose!